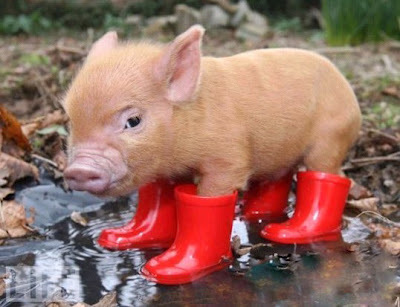 Cutes Pets In the World: How Funny The Mini Pigs! Mini pigs gained popularity. If you are allergic to cats, or your children need a friend which will not scratch or bite, fish or mini pigs are the right pets for your family. Mini pigs are quiet miniature home pets. These tiny exotic animals are tender, smart, clean and odor free. Mini pigs are well-behaved, cute and intelligent, but exotic miniature pets are just animals, and you need to make some changes, redesign your interior and backyard for creating safe home design and fun atmosphere for your pot bellied pig. Usually miniature pigs have nothing against the bath. You can wash pot bellied pigs at the same spot where your miniature pet enjoys swimming. Purchase a special pet shampoo from a local pet store or online. If you can not buy miniature pigs shampoo, wash your pet with clean water and natural bristle brush. Also you can rub miniature pigs skin with a brush without shampoo, rinse, then wrap the pet in a warm towel to dry. Tender pigs can catch cold. 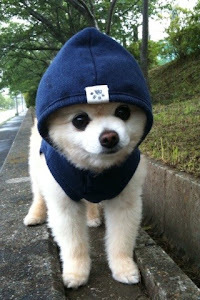 The pets, which grow to be just 14in tall, have become so popular that they are now almost impossible to get hold of in Britain. They have even been snapped up by celebrities, including Harry Potter actor Rupert Grint, who plays Ron Weasley. Micro pigs are much smaller than a standard farm pig and weigh 9oz, about the size of a tea cup when they are born. At two years old they are fully grown and weigh in around 40-65 lb and are around knee height at 12-16in tall. They can live for up to 18 years, but make popular pets as they are low maintenance, quiet and surprisingly clean. 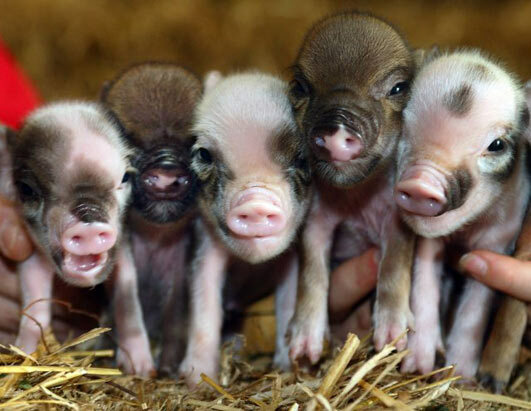 “Micro pigs make fantastic pets as they are very low maintenance. You don’t have to take them for walks and they have very few health issues,” said Mrs Croft, who runs Little Pig Farm in Christchurch, Cambridgeshire. “They don’t make much noise, they are easy to lavatory train and once they have bonded with you they are very loving. “They are actually very clean and never mess in their bedding and are just so adorable. Micro pigs are also good alternative pets for people with allergies. “Lots of people are allergic to cats and dogs but you can’t get allergies from pigs as their skin is very similar to ours, and the have hair not fur” added Mrs Croft. “We’ve had many parents buy pigs for their children who suffer from fur allergies.”The Little Pig farm has been getting 4,000 hits a week and at least 60 emails and 40 phone calls. The pigs are crosses of Miniature Pot Bellied pigs with Tamworths, Kune Kunes and Gloucester Old Spots to create their tiny, colourful Micro Pigs, which are sold for between £195 and £700. The size of the piglets get smaller with every litter with Peanut the piglet believed to be one of the tiniest adult pigs in Europe. She weighed just under 2kg at twelve weeks old and now lives indoors with Mrs Croft as a companion to her dog and sleeps on the sofa. At 13 months she has almost stopped growing and is just 12 inches tall. 1. Miniature pigs need some space to exercise, but these wonder pets can damage your backyard landscaping. Plan and design the area, where your pot bellied pigs can enjoy the nature. 2. Miniature pigs love to swim. Pot bellied pigs do not sweat, and they need to cool down in the water. Pigs enjoy water, and you need to take care of your miniature pet health. If you do not have a pool, design miniature pet paradise for your Oink swimming. Any shallow tray can be used. Fill it up with water to a half of the size of your miniature pig. The water should be warm, at the room temperature, in winter and in summer. 3. Pot bellied pigs do not require pet grooming. Miniature pigs do not shed, and their skin does not smell. However, pigs should be washed. You need to design a comfortable place for your mini pigs bath.